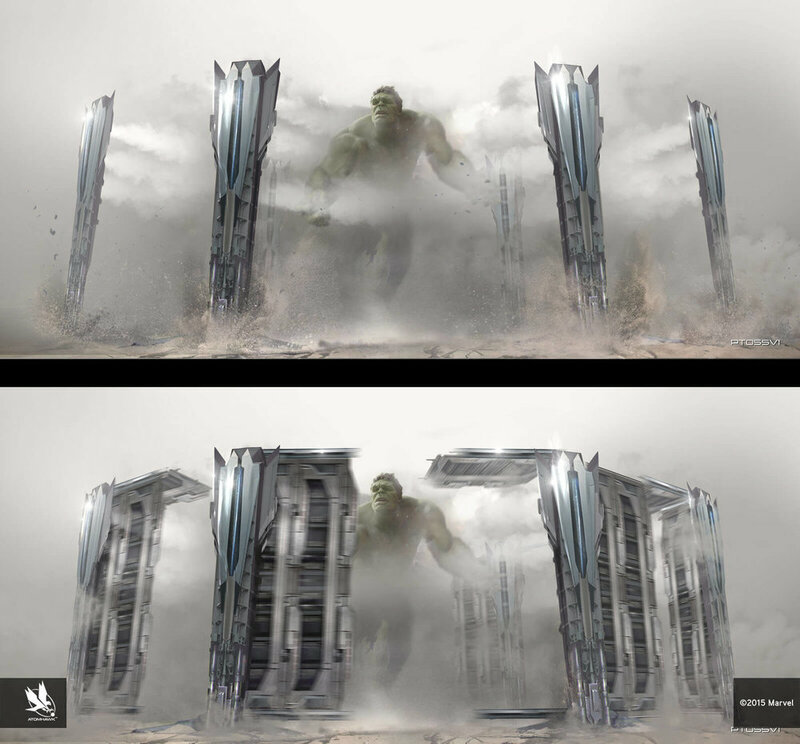 We spent six months working on Avengers: Age of Ultron designing vehicles, key action shots, sets and locations. Our work included the lifeboat-like ships that deploy the helicopter rescue carriers, key shots within the Avengers Tower and Ultron's detonator which ominously appears in the final stages of the film. We drew inspiration from a great range of styles and references; from the colossal spaces of German V-2 underground factories for the Leviathan Chamber to Director Joss Whedon’s own home for the cosy American style of Hawk Eye’s farmhouse. What was the brief for Hawkeye's farmhouse? There wasn't really a brief per se but rather a selection of images that Production Director, Charles Wood, had collected as a point of reference. He explained that what he was trying to achieve was a homely American-style farmhouse situated in a hidden valley somewhere in the US. What is the role of the farmhouse in the film? On the surface it was used as a place where the Avengers could hide from Ultron and regroup, but it was also used to humanize Hawkeye and give him a little back story. With the likes of Captain America and Iron Man having their own origin movie we know them intimately. With Hawkeye we're left a little in the dark up until this point. Having been provided with the images of typical American farmhouses, a couple of days into the work Director, Joss Whedon, handed the film's Production Director an image of his own house as a point of reference and the design moved on from there. 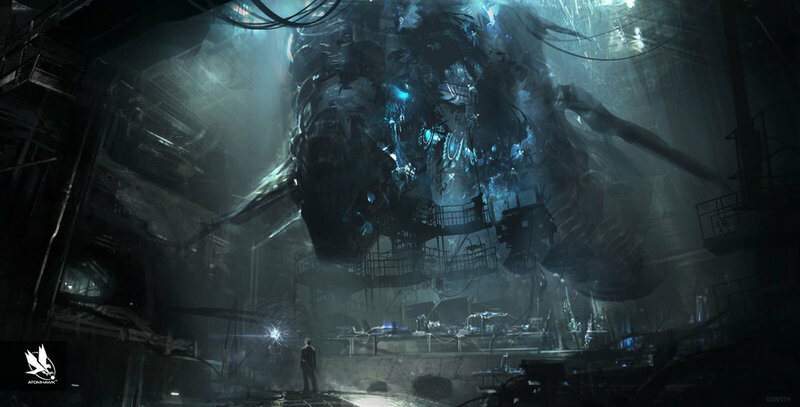 What were the biggest challenges around this particular piece of concept art and how did you overcome them? The challenge for most designs is making them look cool and original but that wasn't the challenge here. The real challenge was to create a rest stop and a contrast to the rest of the movie. Something familiar and human in contrast to the chaos of the rest of the film. The greatest challenge was finding the right mood for the piece and a design for the building that sat well within the desired space. Roughly how long did it take/how many iterations? Like all pieces of art in film there was a few of us working on the farm itself. I worked on this particular part of the film for around 3 weeks, coming up with about fifteen ideas. A couple of these ideas were then developed further and contributed heavily to the styling and design of the final product. How did it look on the big screen? Did it match your expectations? Yeah it matched my expectations. It looked great. It's always a great feeling seeing something you helped create come to life. "The inspiration for this room came from asking in our head, 'What environment would ever exist to house such a massive thing?' while still keeping in mind it needed to be underground. We began looking at German V-2 factories from World War II. Below the factories would be colossal spaces where they would build ballistic missiles. They were creating armaments in these secret military environments. We drew a lot of inspiration from that." Featured in The Art of Avengers: Age of Ultron.